The 2018 Mitsubishi Outlander is offered in five different trim levels – ES, SE, LE, SEL and GT. Shared by the Outlander ES, SE, LE, and SEL trims is the 2.4-liter MIVEC SOHC 16-valve inline four-cylinder engine. Paired with a Continuously Variable Transmission (CVT) that produces 166 horsepower and 162 lb-ft of torque.The premium trim, the Outlander GT, features 3.0-liter MIVEC SOHC 24-valve V6 engine paired with a six-speed electronic automatic transmission which delivers 224 horsepower and 215 lb-ft of torque. Lastly, the Mitsubishi Outlander has a combined fuel economy of 27 mpg and the GT trim features a combined 22 mpg. The 2018 Mitsubishi Outlander Sport is offered in four trim levels – ES, LE, SE and SEL. While, the Outlander Sport ES and LE trim levels share a 2.0-liter MIVEC DOHC 16-valve inline four-cylinder engine, the Outlander Sport SE and SEL share a 2.4-liter MIVEC DOHC 16-valve inline four-cylinder engine. The 2.0L engine on the Outlander Sport SE trim is paired with a five-speed manual transmission and a Continuously Variable Transmission is standard on all remaining trims. The 2.0L engine produces 148 horsepower and 145 lb-ft of torque and the 2.4L delivers 168 horsepower and 167 lb-ft of torque. Finally, the 2.0L engine has a combined fuel economy of 27 mpg and 25 mpg. The interior cabin of the 2018 Mitsubishi Outlander offers plenty of cargo space – a total 128.2 cubic feet to be exact (with second and third row seats folded down). Fortunately for consumers, the Outlander GT trim shares a lot of its premium features with the lower trim levels. Some of those features include a color multi-information display, dual-visor vanity mirrors with illumination, front courtesy floor lights, cargo light, and a center dome light. The Mitsubishi Outlander features maximum seven passenger seating plus 60/40 split fold-down rear seats with independent slide and reclining adjustments, 50/50 flat fold-down third row seats and a gloss black instrument and shift panel. Similar to the Outlander, the Mitsubishi Outlander Sport trim levels share most of the interior features like a color multi-information display, high-contrast meters, front map lights, center dome light, cargo light, 4-way adjustable front passenger seats, 60/40 split fold-down rear seatback, five passenger seating, tilt and telescopic steering wheel plus remote hood and fuel door release lever. One of the biggest differences between the Mitsubishi Outlander and Outlander Sport is definitely the interior space. Compared to the Outlander, the Outlander Sport has a smaller interior cabin with a total passenger volume of 97.5 cubic feet. Many of the exterior features from the 2017 model year remain the same for 2018. With the exception of the Outlander LE 2.4 trim, the remaining Mitsubishi Outlander trims come standard with 18-inch two-tone alloy wheels – the LE 2.4 comes standard with 18-inch black painted alloy wheels. The Outlander ES, SE, LE and SEL trims are standard with halogen headlights, while the Outlander GT 3.0 trim is standard with LED headlights. Furthermore, LED positioning lights, LED rear combination tail lights, color-keyed front and rear bumpers and color-keyed outside door handles add to the Mitsubishi Outlander’s exterior features. Lastly, the Outlander SEL 2.4 and GT 3.0 trims share auto on/off headlights, chrome beltline molding, front windshield rain-sensing wipers, and silver roof rails. 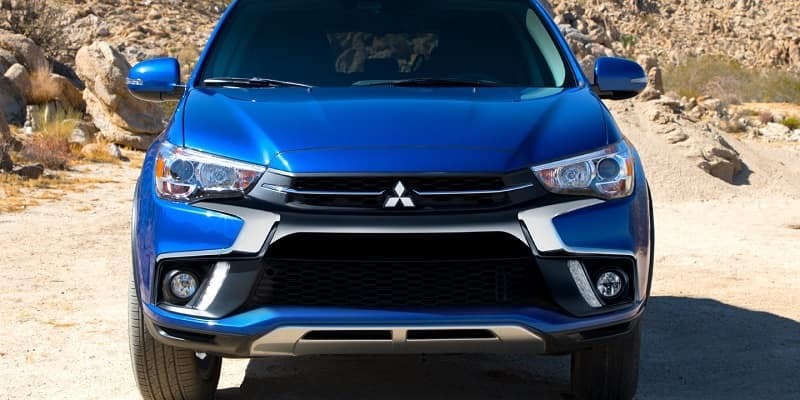 The 2018 Mitsubishi Outlander Sport features a new front fascia characterized by Mitsubishi as “innovative.” The premium trim, the Outlander Sport SEL 2.4, is standard with high intensity discharge headlights, auto on/off headlights, silver front bumper under garnish, chrome beltline molding, power folding side-view mirrors, front windshield rain-sensing wipers, single exhaust outlet with chrome tip, black roof rails, and an SEL badge. LED rear combination tail lights, color-keyed front and rear bumpers, color keyed outside door, wheel arch moldings, heated power side-view mirrors, front windshield variable intermittent wipers and rear window intermittent wiper/washer with defroster are additional exterior standard features shared by all trims. 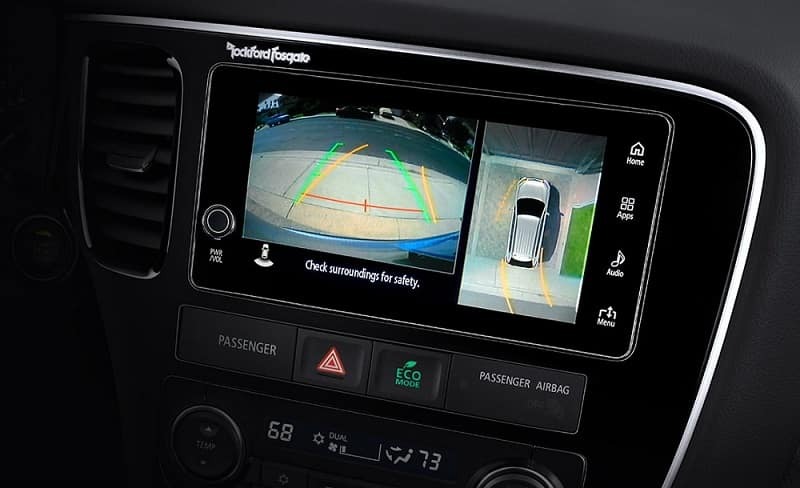 A lot of great technology features can be on the 2018 Mitsubishi Outlander and Outlander Sport. 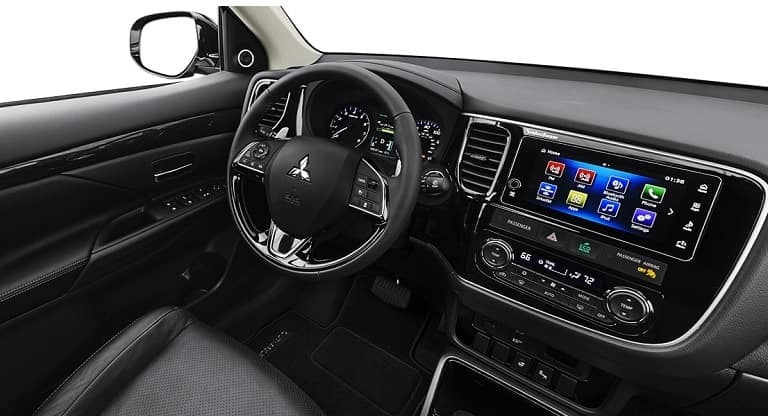 Standard features across the Mitsubishi Outlanders lineup include digital HD radio, AM/FM audio system, bluetooth wireless technology, steering wheels phone and voice controls, 12-volt accessory outlets, and door panel storage pockets with bottle holder. As previously mentioned, the Mitsubishi Outlanders interior cabin is bigger than the Outlander Sports. Because of this, the Mitsubishi Outlander offers underfloor cargo area storage and third row cup holder and storage space. Standard equipped on the Outlander ES 2.4 trim is a 7.0-inch touch panel display audio system with rearview camera. While, the remaining trims are standard with a 7.0-inch smartphone link display audio system, Apple Carplay and Android Auto Compatibility, SiriusXM satellite radio with three-month subscription, steering wheel voice controls, dual USB ports, and FAST-key passive entry system with push button start and panic feature. With the exception of the Outlander GT 3.0, the lower trims are standard with six speakers. An available option on the Outlander SEL 2.4 is a 710-watt Rockford Fosgate premium audio system with nine speakers – yet, this is a standard feature on the Outlander GT 3.0. Standard features on the Mitsubishi Outlander Sport shared across the trim lineup are bluetooth wireless technology, steering wheel audio and voice controls, rear view camera, ECO indicator light, cruise control, automatic climate control, micron air filtration, rear heater floor ducts, 12-volts accessory outlets (x2), instrument panel lower-center storage, front door panel storage pockets with bottle holder, and retractable assist grips. Standard on the Outlander Sport SE 2.4 and SEL 2.4 trims are 7.0-inch smartphone link display audio system with Apple Carplay and Android Auto, SiriusXM satellite radio with three-month subscription, six speakers, digital HD radio, dual USB ports, and FAST-key passive entry system with push button start and panic feature. The 2018 Mitsubishi Outlander was named a Top Safety Pick by the Insurance Institute for Highway Safety (IIHS). Standard safety features shared by all trims include hill start assist, Anti-lock braking system (ABS) brakes with electronic brakeforce distribution (EBD) and brake assist (BA), active stability control (ASC), traction control logic (TCL), seven standard airbags including driver knee airbag, three-point seatbelts and head restraints for all seating positions, LATCH child-restraint system, anti-theft alarm system and anti-theft engine immobilizer. Optional only on the SEL 2.4 and GT 3.0 trims are adaptive cruise control (ACC), forward collision mitigation (FCM), lane departure warning (LDW) and automatic high beam headlights (AHB). The Mitsubishi Outlander Sport trim levels share a good amount of safety features. With the exception of adaptive cruise control (ACC), forward collision mitigation (FCM), lane departure warning (LDW) – which are only optional on the Outlander Sport SEL 2.4 trim, the remainder of the safety features are standard across the lineup. Some of these features include, Anti-lock braking system (ABS) brakes with electronic brakeforce distribution (EBD) and brake assist (BA), active stability control (ASC), traction control logic (TCL), advanced dual-stage SRS front airbags, adjustable front shoulder belts with pretensioner and RISE body construction. The 2018 Mitsubishi Outlander and Outlander Sport both offer a great amount of features to fit any lifestyle. Take the 2018 Mitsubishi Outlander or 2018 Mitsubishi Outlander Sport for a test drive today at University Mitsubishi located in Davie, FL. Visit our website for more information on all of our 2018 Mitsubishi Inventory.